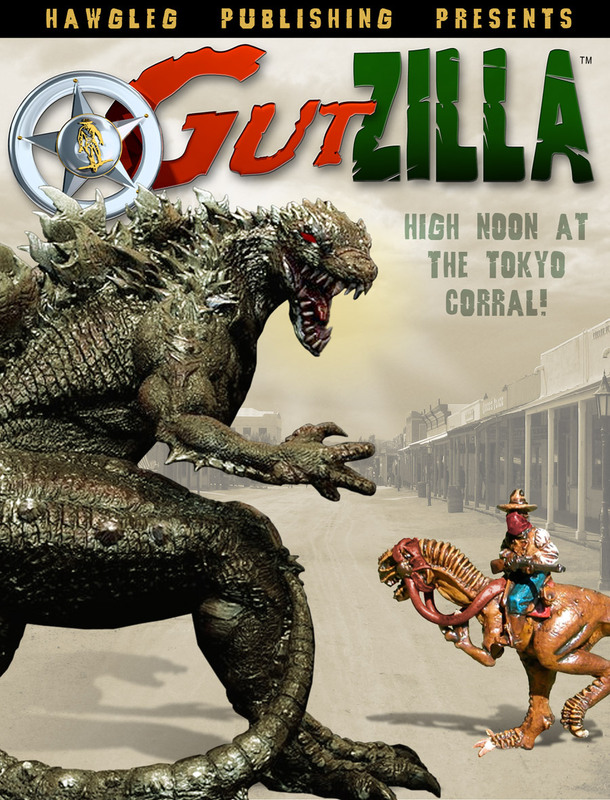 Gutzilla: High Noon at the Tokyo Corral! None-too-fresh from their spring fling in Asia, them Hawgleg boys are back home and ready to grab the bull by the horns--or in this case, the giant lizard by the big, long tail. It is with pride – and more than a little loss of memory – that Mitchell, Murphy and Mauer announce the release of their newest product: Gutzilla: High Noon at the Tokyo Corral! The new product line by the award-winning authors will introduce an exciting new game system and miniatures to simulate giant monsters battling cowboys. The miniatures in the line will range from 25mm – 250mm and include cowboys, mecha-cowboys, monsters, mecha-monsters, and mecha-dance hall girls. "It's a mecha-palooza of giant monster mayhem," said Gushot co-creator Mike Mitchell. "And we couldn't be happier." Rules that facilitate skirmish-level combat between horrific giant monsters (including Godzilla, Gamera, King Kong, Baragon, King Gidorah, and Rozio Don-el) and the cowboys who want to kill them. Monsters, including the aforementioned hideous creatures. 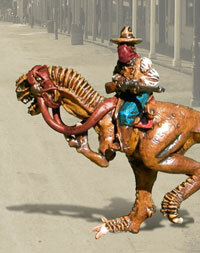 A full line of 25mm Miniature cowboys, dinosaurs and terrain. This particular adventure began with the company's annual spring fling of international travel. Having been put on a "no fly" list for Paraguay and Bongolesia, the trio and their entourage found themselves heading for the Far East. "So there we were, doing saki bombs in a geisha house in Tokyo with our old buddies Forrest Harris and Alex Bates when Mitchell suddenly got it into his head that he wanted to try Sumo Wrestling," said Gutshot co-creator Mike Murphy. "Now, he's been my best bud for more years than I can remember (no, seriously, I can't remember some of them—my therapist says it's some kind of defense mechanism), but there is one thing I know for sure, I do not want to see Mitchell wearing a sumo diaper… not again!" Mitchell, staggering a bit after two dozen saki bombs, was prowling the Chiba district when he stumbled into a club full of men who liked to wrestle in rubber suits. "I instantly felt at home," Mitchell admitted. "It was like I'd found what I'd been looking for my whole life, and as Murphy came in behind me, I think he felt the same way." The two had wandered into an underground Kaiju Kurabu Kenka, or "Monster Fight Club." This club catered to young Japanese men who like to dress up as their favorite monsters and wrestle each other in a ring full of model buildings; the goal being to destroy the buildings and dominate their opponent. The crowd was surprised to see a bunch of white guys enter the club, but when they took a look at Murphy, they just assumed he was there for a fight. "I was wearing my Stetson, boots and leather chaps at the time, so they just figured I was some sort of swarthy American cowboy hero," Murphy said. Before he could protest, the crowd grabbed him and manhandled him into the ring where he found himself face-to-face with a man in a vintage 1955-type Godzilla suit. Unable to speak the language, and separated off from his friends, Murphy soon found himself fighting for his honor, and the honor of Texas itself. "It's been a long time since I've found myself going at it with a man I'd just met, but that didn't stop me from taking matters into my own hands and showing him who was the top in this situation. As my opponent slammed me with his latex-covered tail, I quickly fell back on my street-fighting techniques and hit him with a Texas Twister, Abe Lincoln's Log Hold and a Bongolesian Body Slam," Murphy said. "It was hard, but I had him going down under me in a matter of minutes." Basking in the roar of the cloud, Murphy was carried out of the ring as befits a hero: He had been Christened the Six-Gun Kid and he was the hero of the Chiba District that night. "I was thrilled with his victory," Alex said. "Plus I won 5,000 Yen by betting on the fight. I was really pumped up until I found out that it was only about $54 in US money. That was when I saw Mitchell talking excitedly to a guy in a dark corner of the club." That 'guy' would soon change all their lives. The man turned out to be the grandson of famed Japanese movie director, Akira Kurasawa, and he was a fan of the Kaiju Kurabu Kenka lifestyle. Or, in other words, he liked hanging around with guys in rubber suits. Kurasawa Sama quickly spirited the boys off to a tea house to discuss business. Paul, of course, chose to stay outside and guard the bail money. Once inside, Kurasawa Sama quickly got down to business and made the Americans an offer that they just couldn't refuse. He wanted to work with them to develop a line of products that would combine rubber and leather: specifically, he wanted to combine his Japanese kaiju with American cowboys. "I have enjoyed playing with my own kaiju since I was a young teenager," Mitchell exclaimed. "I've gotten a lot of pleasure from it and now I can't wait for people to get their hands on it so I can share the fun with all the other guys who love it, too!" Kaiju eiga is the Japanese term for "Giant Monster Movies," explained company apologist Paul Mauer. 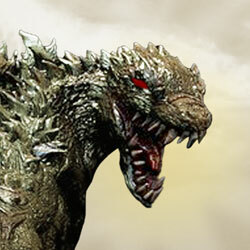 "I've always loved those old Godzilla and Gamera monster movies," Mitchell explained. "Even though the effects were often low budget, they were entertaining and, for the most part, are superior to many of the effects done today. There's just something a guy in a rubber suit knocking over toy buildings and smashing toy tanks and planes that's fun to watch. Given the choice between modern CGI and old school effects, I would always prefer to watch a movie with a sweaty guy in a rubber suit." As a fan of the genre, Mitchell collected quit a number of Godzilla and Gamera action figures over the years. The action figures have even made it to the game table a few times thanks to games like Giant Monster Rampage rules by Kenny Lewis. "Those lumps of vinyl and plastic have brought me a lot of pleasure," Mitchell admitted. "Especially when combined with a helping hand from Kenny." "This ain't our first rodeo," Mitchell said. "So, with all the guys pulling together in the same direction, we were able to get everything up and running in record time. With figures by Hexxenhammer, rules by us, and terrain by Arnica Real Estate, we were able to take this from an idea to a concept in almost no time at all. I really think most people would be amazed at how little time this actually took." The rules themselves won't be available any time soon, nor will the figures. Yup, that's all because, once more, this is just another lame April Fool's Day story! There ain't no book and Mitchell denies that he and Murphy are going to "Mud Sumo Wrestle" at GenCon next year. And, once again, we apologize for drinking and typing! Thanks to Hexxenhammer for permission to use his photos in our annual tomfoolery.